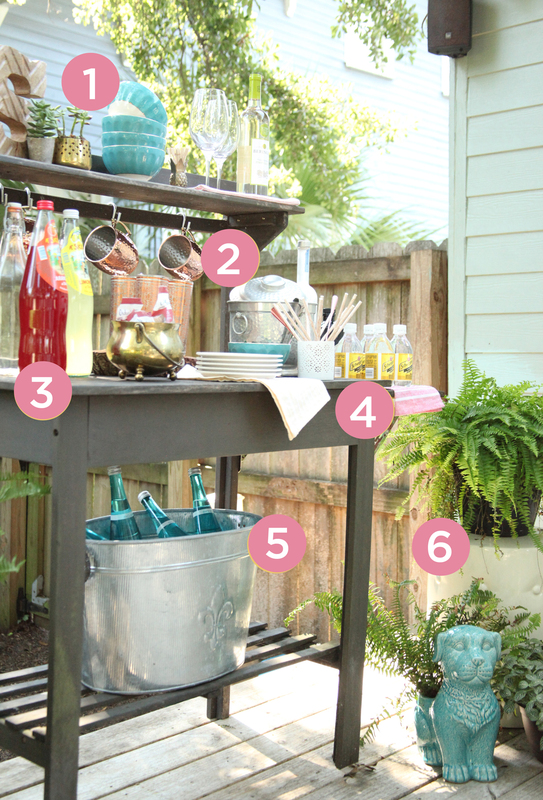 I love designing with versatile outdoor furniture, and a potting bench can be used in so many ways, including a drink and snack station to pull your guests outside while you’re entertaining for the big game. 1. Think high and low: Place items at various heights – on top of a shelf, at prep height and on the bottom shelf. In the photo, you can see we’ve put blue bowls high, one in the center, and blue bottles and planter at the bottom to balance the color throughout the composition. 2. Bring in shiny objects: Pops of various metallics on left, middle, and right sides for balance. Remember the metals don’t have to match to be effective in drawing the eye in. 3. Live in full color: We used dishes, drinks and containers to pull eye-catching color onto the bench. 4. The eye likes texture too: Visual texture is something that draws us in. For this party, we included a perforated container to hold paper straws and drink stirrers to create a textural element. 5. Cover the basics: Pretty is great, but it has to function. Make sure you have all of your guests essentials ready all in one place: Water, ice, small plates, napkins, toothpicks, cups, etc. 6. Soften it up with plants: Using plants and containers that work with the rest of the elements listed will make it feel like you’ve perfectly combined indoors and outdoors in one entertainment area. Remember to have fun with it, and use what you have on hand to create the ultimate snack and drink station without breaking the bank!